Summary: Armed with a suitcase and an old laundry bag filled with clothes, Kasienka and her mother head for England. Life is lonely for Kasienka. At home her mother’s heart is breaking and at school friends are scarce. But when someone special swims into her life, Kasienka learns that there might be more than one way for her to stay afloat. Sarah Crossan is officially one of my favourite authors. The Weight Of Water was the last book that i had to read of hers, so i can officially say that i love her now, right? She’s a fantastic story teller and verse writer, it’s hard not to fall in love with each of her stories. Kasienka’s life is turned upside down when she is taken from her home in Poland to England in search of her father. He left months ago, but now her mother wants them to return as a family. Kasienka has to face the struggles of growing up and becoming apart of a community where she is looked down upon and bullied, and her only friend is her middle aged next door neighbour. I will never be bored of Sarah Crossan’s writing style. Verse writing is now one of my favourite styles to write in, so it’s great for me that two out of three of her novels are written in verse. Verse seems like the perfect way to tell The Weight Of Water as it flows better than any other way of writing. You can understand Kasienka’s jarred feelings and thoughts much more when they are written in poems. I really thought that worked well. A particular favourite poem of mine within the novel is ‘Disco’, in which Kasienka has to deal with not fitting in with her peers. Another strength is that the characters voices come across really well. I’ve always connected with the characters in her novels, and this is no different. I think The Weight Of Water will be another novel that leaves me thinking for a long time after i’ve put it down. Some of the poems and the way they are written stick in your mind. This novel might not be for everyone. Sarah Crossan’s protagonists tend to be a little on the young side (thirteen or fourteen) but the way that she talks about things they are going through in their lives makes them seem so much older. I can understand that the age might put a lot of people off, but she writes in such a way it makes it interesting and relatable no matter what your age. 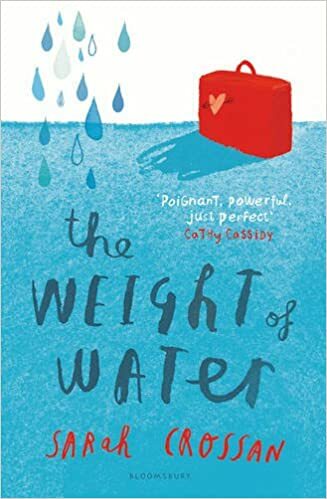 The Weight Of Water was not my favourite Sarah Crossan novel, however it was a wonderful story about a situation that is very common but you don’t hear about too often. That much detail is never put in to someone’s life who has migrated to another country, and the problems they face. It also has serious messages about bullying and other topics that are quite relevant today. It’s a definite read for any young reader!